I’ve done a few posts over the past few days on how I’ve been trying to use up all the little bits and pieces of card stock and DSP I have lying about my office/craft room. I have been on a mission lately and made a pile of cards from the paper cluttering up my desk. I donated them to a local op shop which makes me feel good as well as well as having an (almost) clean desk! 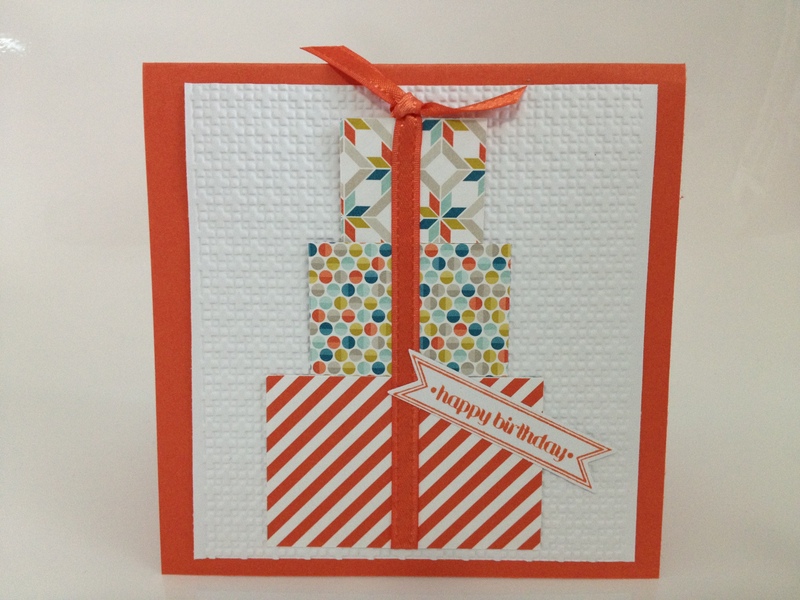 Here’s another card design which is great for using up scraps. 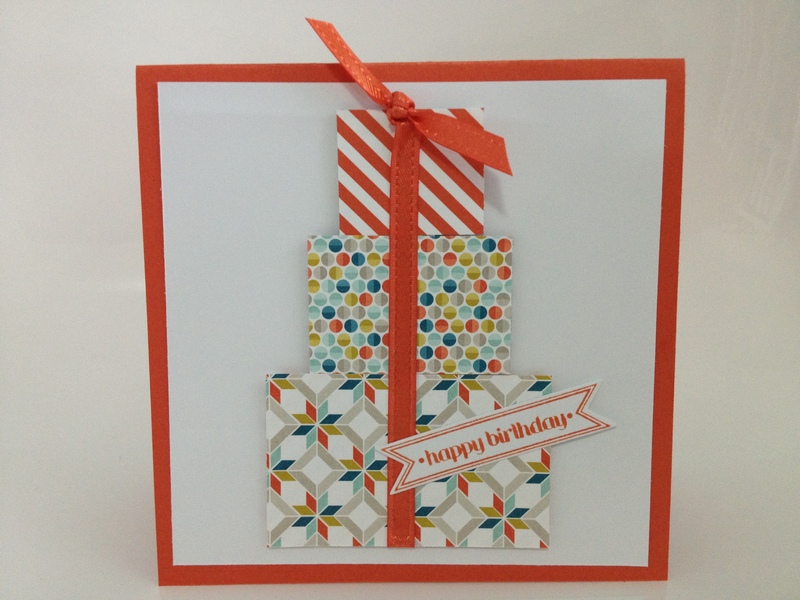 I’ve used Tangerine Tango (14cm x 14 cm) and Whisper White (13cm x 13cm) card stock with scraps in varying sizes from the Sycamore Street DSP & Tangerine Tango ribbon from this year’s Sale-A-Bration. One tip – when assembling the presents I used a small scrap of offcut paper and stuck the rectangle “presents” to the scrap. This made it really easy to keep the rectangles aligned and tie the ribbon before attaching the “presents” to the Whisper White card. I also made a version where I ran the Whisper White version through the Big Shot with the Square Lattice embossing folder. 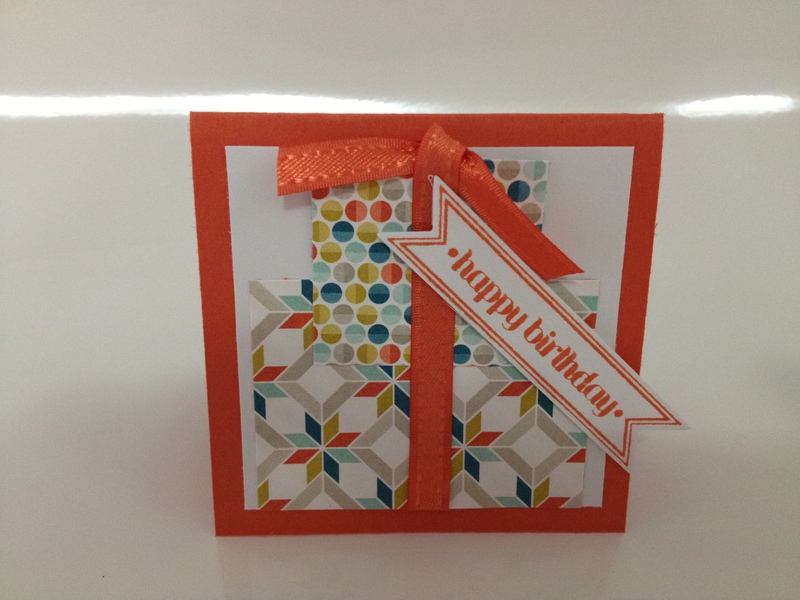 The Happy Birthday label is stamped in Tangerine Tango on Whisper White from the Itty Bitty Banners stamp set and cut out with the matching framelits. This basic design could be used in any colour scheme – I think it would look great in ‘Christmassey’ colours as an easy but effective Christmas card too.